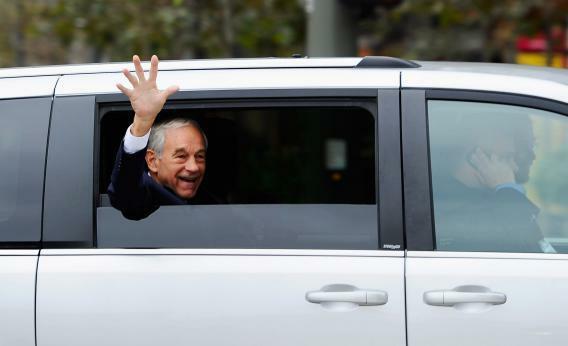 LOS ANGELES, CA - SEPTEMBER 17: Republican presidential candidate Rep. Ron Paul (R-TX) arrives at the California Republican Party Convention on September 17, 2011 in Los Angeles, California. It’s fair to say Michele Bachmann would need a miracle tonight to recover from her remarkably squandered opportunity on the HPV vaccine issue. Barring that, the entertainment value at the sixth GOP debate will have to be provided by the tension between Rick Perry and Ron Paul. If Paul especially pisses Perry off, it’s little wonder. Ron Paul has made an art of being aggressive without seeming to be so. “I don’t want to annoy the governor,” the Texas congressman said at that media breakfast. (Yeah, right.) His rumpled, smiley appearance seems designed to disarm, as does his reputation. With his absolutist libertarian views and his grassroots operation, he is widely regarded as longer than a long shot. Mainstream republicans view him as “very flaky,” in the words of one political scientist. He gives slow, meandering answers at debates, creating the impression that he’s a harmless old eccentric. So when he jumps on Perry, his attacks seem like ambushes. During the last debate Perry grinned when Paul went after him. It was a grin of superiority; it said, Who the hell is this guy, and why does he think he can take me on? But Paul was a mosquito that would not be swatted away. Tonight, one imagines, he will be buzzing around Perry’s head again.